Helena Morrissey CBE and founder of the 30% Club gives the Cass Dean's Lecture on 'New approaches to diversity: how to develop more inclusive cultures from here'. Helena Morrissey CBE is CEO of Newton, a global investment management subsidiary of BNY Mellon that manages around £50 billion for pension funds, charities and through funds available to individual investors. She is also founder of 30% Club a cross-business initiative aimed at achieving a minimum of 30% women on FTSE-100 boards through voluntary, business-led change. “In today’s world, the idea of including diversity as a part of what it takes to develop healthy organisational cultures and to run a modern, forward-looking business is well accepted and understood. Most leaders of organisations would say that improving diversity, from the imperfect situation that we still have today, is one of their top priorities. “However, once you look beneath that goal, you often find that the actual approach to bettering diversity within an organisation is either very siloed: delegated to certain people to resolve; or it’s left to a number of specific initiatives. The approach isn’t really embedded and there’s no focus on the day-to-day behaviours people are seeking to change. But, we have the opportunity to take a different approach”. She founded 30% Club in 2010 and held its first major seminar at Cass Business School in July 2011. The Home Secretary, Rt. Hon Theresa May, MP, then also Minister for Women and Equalities, spoke at the event. One of the major new points to emerge from that seminar was made by Martin Gilbert, CEO of Aberdeen Asset Management, who suggested that if institutional investors really got behind this issue, it would take only a year to see meaningful change. However, the change Morrissey hoped to see after founding 30% Club was not as swift as expected, “I became disappointed and disillusioned by how little progress we were making in getting more women in senior roles. There was so much effort with very little to show for it”. Morrissey said that initially 30% Club’s mission was well-intended but vague, “I realised we were doing two things wrong. Firstly, we needed a measurable goal”. Morrissey is known for being against legislative quotas, “I believe it’s a very old-fashioned, combative approach to solving something that requires a more collaborative culture”. She added, “Secondly, we needed more involvement from those in power. Changes happen when those with the power to make the change realise it is in their best interests to do so. Therefore, the key members of the 30% Club needed to be the chairmen whose boards we were trying to change”. Today, the work of 30% Club, alongside other initiatives, has clearly made significant progress, “In the past five years we have seen quite a dramatic increase in women on FTSE-100 boards – from 12.5% to 26.1%”. Over time the organisation adopted a broader view of how to tackle the lack of diversity. 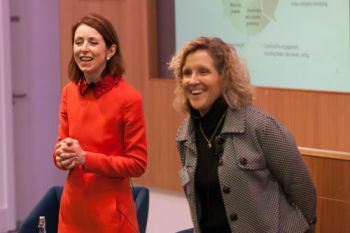 It started an Investor Group, helping to coordinate the investment community’s approach to the issue and also developed a mentoring scheme offering cross-company and cross-sector mentoring to women in their mid-careers. Additionally, 30% Club works with schools and universities, for example Cass is pleased to announced that it will be launching two new 30% Club Scholarships for its Executive MBA. The scholarships will amount to 50% of course fees for students accepted to the EMBA September cohort or the Modular EMBA March cohort. Morrissey believes the movement towards change has taken on a new lease of life, “I think organisations realise there is an imbalance in their organisations and in their boardrooms. It’s not just about putting a few more women at the op and its job done! This thinking only masks the lack of progress; I want to see us re-prioritising the corporate agenda. Also, it’s not about asking women to step-up for these senior roles and then join the men’s club". She said, “We have to move away from tokenism – hiring a woman to sit on the board because she is a woman only masks the problem of gender diversity. Women need to be women all the way through their career and we have develop a culture that affects meaningful change. “We have to develop a culture where both genders and other types of under-represented groups can rise and create more balance so we can complement each other. I also hope that our efforts will lead to more options for men to break through the social pressures surrounding working practices and their prescribed roles in family life”. She concluded, “We must make it work for each of our families, for each business and in doing so we will have a happier, more productive culture”.